Imagine yourself surrounded by all the joy and happiness possible. You and your family have worked your entire life to get to this point. Then a nightmare infiltrates your inner sanctum of happiness. This nightmare is the Nazis stealing everything you have worked so hard to obtain only to have it ripped from your helpless grasp. This is what happened to countless Jewish families, but in this case it specifically revolves around Maria Altmann (Helen Mirren) as she attempts to re-acquire her stolen painting, The Woman in Gold. To help her do so, she tasks the assistance of novice lawyer Randy Schoenberg (Ryan Reynolds). Together they might have a chance to trump the Austrian government and retrieve what was wrongfully taken so many years ago. 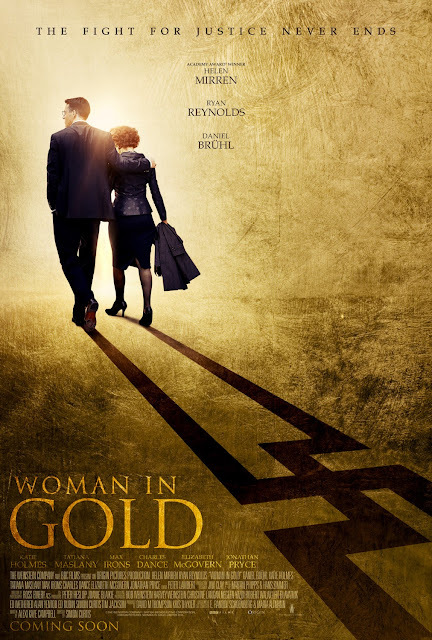 Consider each half of Woman in Gold to be a development cycle. The first half of the film delves into the back-story of Maria as she must face the demons of her past. These traumatic events are not left unexplained, but instead dug into entirely to show us not only the horrific actions of the Nazis, but the dread and hopelessness Maria had to face in order to escape their evil ways. The second half of the film focuses on how the situation is affecting Randy. Randy constantly finds himself oddly compelled to finish this one task. He faces so many family and financial complications that its not even funny. I went through the entire first half of the movie thinking "Reynold's character is going to end up hugely underdeveloped," and boy was I glad I was mistaken. The Woman in Gold truly is a work of art. Helen Mirren and Ryan Reynolds provide a stupendous emotional rollercoaster that provides insights onto the horrors outside of the Holocaust. Additionally, the supporting cast of the film leaves an impact on the audience from each of their characters alone. All these components lead me to say that this film is a masterpiece of film making.